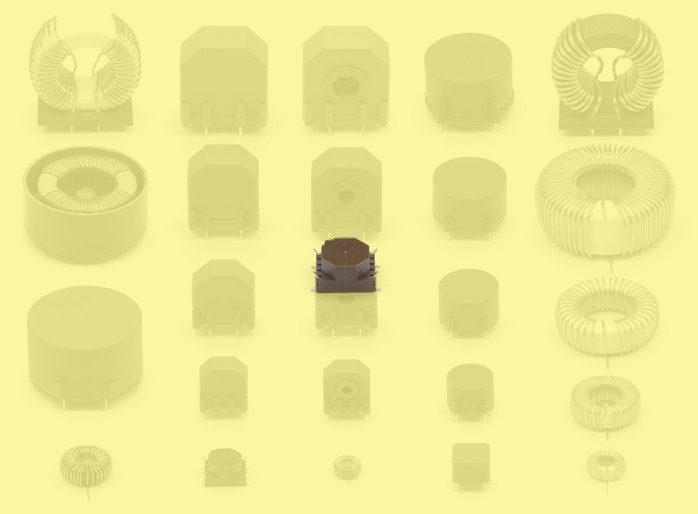 Common mode SMD chokes are based on high permeability ferrite toroids with two symmetrical windings. The operating current flows through them in such a way that the magnetics fields cancel each other out. The operating current is only affected by the low stray inductance of the windings. If the currents in the windigs are different, because of asymmetric interference, a high inductance works on the differential current. Common mode chokes are used mainly for RFI suppression of appliances, switch-sources, consumer electronics and machines. Moreover these highly symmetrical chokes can be used as transformers as well as for potential separation. Our standard offer consists of chokes PMEC 100/SMD series. Testing voltage (winding - winding) 1500 V, 50 Hz, 2 sec. The nominal current is applicable up to ambient temperature of 60 °C. Above this temperature descends the acceptable current linear to zero at 125 °C.